FancyGrid is a complete solution for creating Grids for your web applications. FancyGrid is a grid library which comes with chart integration (highcharts and sparkling), server communication and many other useful features. This library includes more than 25+ features like paging, sorting, filtering, validation, Ajax data, files data, REStful, touch support, Angular JS directive and much more. FancyGrid is a plugin free library and it has no dependency but integrated with jQuery and AngularJS. FancyGrid also includes number of samples, professional support, elegant API and of course detailed documentation for easy use. Also it has big form module(FancyForm) that is integrated with FancyGrid. Ember Table allows you to handle very large data sets by only rendering the rows that are being displayed. It is written as an ember component with an API that is easy to understand and extend. It includes lazy rendering and supports millions of rows, has support for column resizing and reordering, and easy to configure, customizable and extendable. With this js grid view component, you can easily create nice-looking, Ajax-enabled tables with rich in-cell editing, built-in filtering, searching, and grouping capabilities. Smart Rendering and paging support ensure fast loading speed even with huge datasets. Numerous event handlers allow you to add necessary interactivity to the grid. 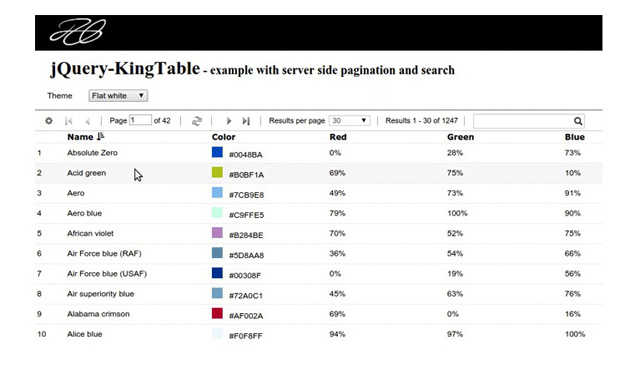 KingTable is a jQuery plugin for administrative tables that are able to build themselves, on the basis of their input data. It supports client and server side pagination; client and server side search; custom filters views; automatic menu to hide and reorder columns and support for custom tools. Client side export feature into: csv, json and xml formats.